Like most of the world, we have watched the rapid decline of civil liberties in Turkey after the election of President Recep Tayyip Erdoğan and his coalition of Islamic parties. Just last month, we discussed the arrest of Mehmet Emin Altunses, 16, who allegedly committed the crime of “insulting” Erdoğan. calling people who use birth control “traitors” and saying Muslims discovered America, you are not allowed to be disrespectful or insulting in discussing Erdoğan. The lawyer for a model and former Miss Turkey says she could face up to two years in prison for social media posts that prosecutors have deemed to be critical of President Recep Tayyip Erdogan. This includes the recent arrest of a Dutch journalist while Erdogan announced that Turkey was now a leading protector of the free press. The downward spiral of civil liberties in Turkey under Erdogan and the Islamic parties continued this week with announced prosecution of model and former Miss Turkey Merve Buyuksarac, 26, for criticizing Erdogan. At issue is a simple satirical poem on Buyuksarac’s Instagram account. Buyuksarac now faces two years in prison for quoting a few lines from a poem called the “Master’s Poem” from weekly Turkish satirical magazine Uykusuz. Erdogan’s totalitarian measures have earned him the nickname “Buyuk Usta” (the Big Master). Prosecutors have simply declared that this is not a case of “freedom of expression” because it “exceed[s] the boundaries of criticism” and is “overtly humiliating” the president. We have previously discussed the fundamental failure in many Islamic countries to accept the premise of free speech, particularly in conflict with religious orthodoxy. This is an example from a nation that was once the hope of civil libertarians in the Islamic world as a secular nation. What is truly ironic is that, when Erdogan was mayor of Istanbul, he was imprisoned for four months for reciting an Islamist poem that was deemed an incitement to religious hatred. Back then he demanded the freedom of speech that he now denies to his critics after taking power. Annie Scott is not as bad as Erdogen. Although he is stuck in the past imo. Here is some Scott tissue. Karen S: we at the dogpac are waiting to see who the RepubliCons nominate in 2016 for Prez. Then we will invest. 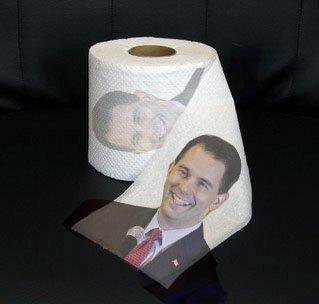 If Scott Walker gets the nomination our tag line at the bottom of each sheet will be: Walkers On A Roll. If it is Jeb then the tagline will be: Wipe Behind The Bushes. Or: Let No Bush Be Left Behind. If its Rand Paul, the tagline: A Choice Not An Echo. If it is Romney: Wipe With Gypsy. BitchinDog – I think that is a marvelously freeing thing to do, although I would not penalize the housekeeping crew by not flushing. I think the Jihadi John photo potty paper will be very popular. Well, maybe if Turkey drops the charade of being our fair weather friend, the US will finally start pressuring them to apologize for the Armenian Genocide they claim never happened. You can go on Google and look up Supply Side products and photos on toilet paper. You can order four rolls of toilet paper with Erdogan’s face by simply sending them a photo (take it off the blog here) and sending them roughly ten dollars. Place the toilet paper in strategic places and at your parties. If you are in DC you can slip some into government restrooms at the Capital and in NYC you can put some in the restrooms at the UN. This way you can wipe and not flush. Leave that job to the next critic. I agree. It’s like marching arm in arm for freedom of speech and then promptly arresting citizens for engaging in their freedom of speech… These world leaders aren’t champions of freedoms when they’re actively shutting down said freedoms. I love it. Erdogan hates other peoples civil liberties. But most leaders who hate civil liberties (aka most world leaders) at least eloquently pose as guardians of liberty. Erdogan manages to sound more absurd and ignorant each time he violates a persons rights. Why of course he is protecting the press. If he did not imprison them they would be left living in a world where some crazy could walk into their place of employ and kill them. In prison he can keep them safe. His opponents believed in free speech, while he did not. Erdogan saw it was merely a useful tool, to be discarded when no longer needed. American leftists are no different. In the 1950s and 1960s, they clamored for free speech. Now they demand speech codes, bans on ‘hate’ speech, and even forced speech (making wedding cakes for gays). Heck, they’re even taking over the internet just like the Chinese communists. They use the same reasoning as Erdogan. Men of little substance have big egos…. The ME is not a beacon of human rights. Unfortunately, it is backsliding even further. So sad. Change has to come from within, from the people. They have to get tired of this. But if they threw Erdogan out, in today’s climate, he would just be replaced with another caliphate. You folks who live in Turkey and read this blog need to do something about this guy. The time for secular revolution is now. Mr. Erdegon is headed towards becoming a dictator and Turkey has lost its status as a democracy. They had a shot at becoming a nation with western values but failed. Now the Turks are reverting to once again being a Middle Eastern autocracy. Makes you yearn for the days when the Army protected the secular Republic from religious extremism and plain old religiosity as Ataturk intended. Freedom for me but not for thee.